"Rare BSA Beaver you don't see many of these complete . stored for many year's in a barn overall not bad condition and runs fine "
eBay 'Buy it Now' for £849.00. Sold? in Jan 2013. "1979 Norton Villiers Triumph 175 Rambler. Chassis Number 42. Numerous MOT's confirm the mileage is accurate (10,000), and the bike needs little other than mild fettling - not having been started since mid summer. It had a new battery then, and several other components. The front mudguard needs readjusting -the weight of my bike cover (it is dry stored) has bent it down slightly. Its a nice, honest bike. Extremely rare- I haven't been able to find much about it - although i did buy a BSA book(let) which helps a little. Its part of the package." Seller states: "original bike only thing not original is rear light and tailpipe. 4 Months MOT"
The Yamaha Motor Company and its parent corporation, Nippon Gakki Co. (which translates as Japanese Musical Instrument Company) have satisfied literally millions of customers in their 80 years of business life. Customers ranging from musicians to motorcyclists! Very few of those customers, however, have any idea of the origins of the corporate giant that is now one of the acknowledged leaders in the varying fields of musical instruments, audio equipment, boats, marine engines, motorcycles and sporting equipment such as skis and tennis rackets. 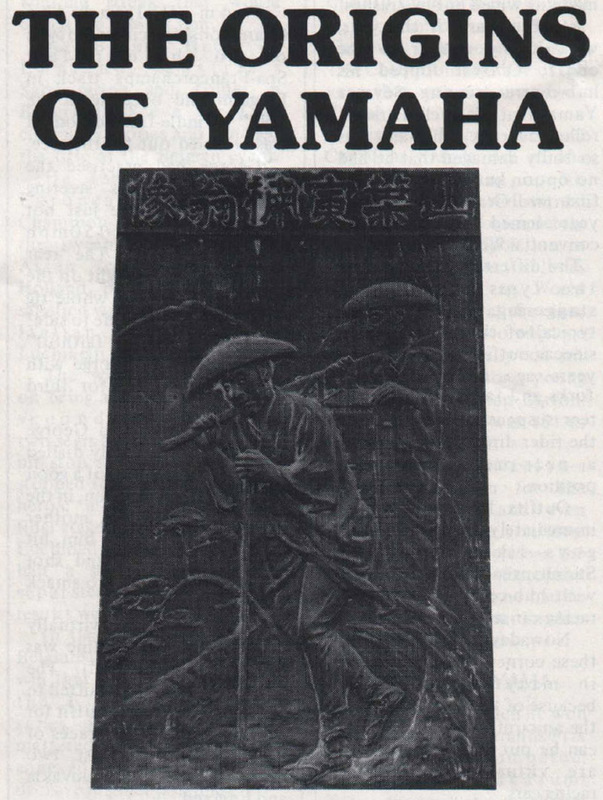 The Yamaha story begins back in 1851 when Torakusu Yamaha was born as the third son of an astronomer in the employ of the powerful Kishu clan in feudal Japan. As he grew up, the young Torakusu trained as an engineer and began his career as a watchmaker and clock repairer in Nagasaki. Soon afterwards he moved to Osaka to specialise in medical equipment engineering and manufacture. It was this switch that led to the eventual formation of Nippon Gakki for one day Yamaha was sent over to Hammamatsu, there to perform some repairs to medical equipment in the local hospital. Torakusu enjoyed life in Harnmamatsu and decided to settle there, working on various mechanical jobs. Today, the giant Yamaha factories are still located in that city! The next turning point in Yamaha`s career came one day in July l887 when he was called upon to repair a small organ belonging to the Hammamatsu Elementary School. The organ was an imported model that was a prized school treasure as well as a valuable educational item. It had ceased to pipe out sounds, and though Torakusu had never before worked on any musical instrument he soon had it operational once again. Fascinated by the instrument, Yamaha decided to copy it and build one of his own. Two months later the ingenious engineer had completed his own organ. It worked perfectly but Torakusu had no musical training and therefore was unable to judge whether his organ was as good as the original. 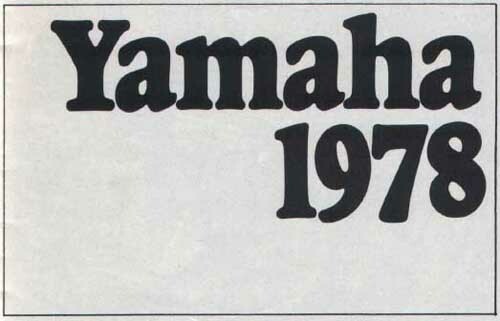 There was only one answer as far as a man of Yamaha’s high standards was concerned. In order to gain an expert opinion he and his craftsman assistant slung their organ from a bamboo pole and carried it on their shoulders to the Tokyo Music Institute (now the Tokyo Academy of Arts)! The woodcut illustration accompanying this feature shows Torakusu Yamaha and his assistant carrying that first organ to Tokyo. The journey was over 100km and the verdict that awaited Yamaha was a cruel one, Head of the institute, Shuji Izawa, said that the organ was superbly made but hopelessly out of tune! He suggested that Torakusu should remain at the school, study the basics of music and then try once again. After a month’s hard study, Torakusu returned to Hammamatsu, constructed his second organ and returned to the Institute in Tokyo with it. “At least as good as the import" was the verdict this time ... and so began the next phase of the Yamaha story. His confidence aided by the verdict of the experts in Tokyo, Yamaha began production of the organs and, in 1897, constructed a new factory to handle these. The Nippon Gakki Company came into being, soon expanded its range to include pianos, harmonicas, xylophones and other small instruments and was the foremost Japanese company in the musical instrument field when its founder, Torakusu Yamaha, died in 1916 at the age of 61. Following Yamaha‘s death, the presidency of the company was taken over by former police chief, Chiyomaru Amano. His tenure as president, however, was marred by a series of crises. Two factories were burned down in quick succession and then, before re-construction had finished, the replacement factory was hit by the great Japanese earthquake of 1923. At the same time, Japan was nosed diving into a recession and Nippon Gakki - already struggling from the disasters that had struck it - was not spared from the effects of the bleak economic climate. As if all of this was not enough, the company also became a target for one of Japan’s newly-formed labour unions. In fact, the Nippon Gakki dispute of that era is still considered one of the three worst labour strikes ever experienced in Japan. The total effect of all this was that the company was on the brink of bankruptcy. A saviour appeared in the form of Kaichi Kawakami, who gave up a dazzling career as a rising young executive in the Sumitomo Electric Wiring Company to take on the seemingly-hopeless task of rescuing Nippon Gakki. Miraculously, Kawakami was able to restore the past glories of the company and take its prosperity to new heights. He was also the person who took one of the most significant steps in the corporation`s history ... the decision to construct the Yamaha motorcycle. During wartime, Nippon Gakki had been using its extensive engineering facilities to make aircraft propellers. There was no demand for such non-essential items as musical instruments so Nippon Gakki were able to turn their expert knowledge in the field of wood-crafting (an essential in the musical instrument business) to the construction of propellers. As the war went on, Nippon Gakki’s technology kept pace with current developments so that eventually they were able to replace the wooden propellers with sophisticated, variable pitch metal ones. When peacetime came, the young engineers on this side of the Nippon Gakki business were sitting idle and it was Kawakami's foresight that was able to see the lightweight motorcycle as an integral part of Japan’s rebuilt economy. He felt that the motorcycle would supply a cheap and reliable transportation need, Nippon Gakki had the technology available to construct such a machine and so the die was cast. There was to be a Yamaha motorcycle. Kawakami himself did not see the project through to total completion as he retired in 1950 for health reasons. His son, Genichi, took over the presidency of the company and, five years after his father’s retirement, put the first Yamaha rnotorcycle (the 125cc YA1) into production. Now, little over 20 years later, the name Yamaha has become synonymous with high-quality motorcycle engineering while Nippon Gakki continues to be one of the world leaders in the musical instrument field. Not even Torakusu Yamaha could have envisaged such a growth for the company that he daydreamed about as he and his companion trudged to Tokyo with that first Yamaha product! For 1978, Yamaha have a three-machine trials range headed up by the well- proven TY250, the machine developed by Mick Andrews, double European Trials Champion, and used by hirn to win such classics as the Scottish Six Days Trial. The TY250 lines up alongside another popular Yamaha trialler, the TY125 that combines performance with lightweight for those trials riders who prefer to utilise a favourable power to weight ratio rather than outright horsepower. Finally, there's the little TY50M ... a little jewel of a trials bike in miniature with a 3.2bhp 50cc engine featuring reed valve Torque Induction, Autolube oiling and a four-speed gearbox. The Yamaha TY50M might be a lightweight in terms of engine size, overall dimensions and horsepower but it’s very definitely in the "heavyweight“ class when measured in terms of its "go-anywhere" capabilities. The little TY50M is a genuine trials machine, capable of tackling many of the same sections as its bigger brothers in the Yamaha trials range. Just like the rest of these machines, the TY50M draws on the experience of double European Trials Champion, Mick Andrews, and this experience is reflected in the machine's styling and specification. It's no “boulevard" bike posing as a trials machine ... the TY50M, while quite happy cruising the cafes, is quite capable of dealing with the rough stuff. For off-road enjoyment, trail riding, novice-class trials or even as a snappy little street bike, the TY50M brings the real excitement of a genuine competition machine to motorcycling's smallest category. You can’t really call the Yamaha DT400 "a wolf in sheep‘s clothing" for the bike is one of the toughest-looking on/off road machines ever built. Even so, the description almost fits because the sleek, stylish lines of the DT400 give no hint of the power available from the big two-stroke single. Fully at home on the street, with the five speed transmission and 29bbp motor giving a more than respectable high-speed cruising ability, the DT 400 comes equipped with all the luxuries of Life. Turn indicators, powerful headlamp. deep, comfortable dual seat, passenger footrests and speedometer / tachometer panel angled at 25 degrees towards the rider for easy vision. Despite all of these niceties, a single glance at the DT400 reveals that it was destined to do something more than provide transportation to the office (though it would function quite competently in that role). The monoshock chassis is a direct development of the unit used by Heikki Mikkola to win the 1977 World Championship and the 400cc motor bears a great deal of similarities to the Championship-winning machine. The off-road performance capabilities of the DT400 rank on a par with many pure moto cross racing machines and yet the big Torque Induction two-stroke is flexible enough to ride as a trials-type machine! The reed valve induction aids in this respect and Yamaha Autolube oiling system plus Capacitor Discharge Ignition also combine to make the DT400 unit the kind of reliable power unit that you need if you are going to embark on the kind of long distance cross-country expedition that the big Yamaha seems to invite. The Yamaha DT400 is meant for the kind of motorcyclist who enjoys his freedom ... the freedom to ride the wide open spaces at speed. But it also gives that motorcyclist a second choice ... a powerful bike for road cruising while flexible enough for commuting. It is the absolute essence of the dual-purpose machine: capable of completing the International Six Days Trial on the one hand while happily dealing with six days commuting on the other! It's not uncomplimentary to suggest that Yamaha's DT250 Enduro machine sets a double standard ... especially when that double standard is the best possible compromise between the demands of street and off-road riding! In each of these areas the DT250 sets riding standards that other manufacturers can only hope to emulate, The superb Yamaha DT-Series power unit has been the subject of constant improvement and development since it first appeared a decade ago. Now it represents the ultimate state of the art in the attempt to design a power unit that will perform as well on the open road as it does on the moto-cross track. Versions of this have powered Yamaha moto-cross machines to World and National Championships and the latest DT250 features another direct development from the racing scene ... the monoshock cantilever chassis. Proven both in moto-cross and road racing, the monoshock chassis revolutionised the world of suspension development when Yamaha introduced it five years ago. And Yamaha is still the only major manufacturer to utilise the cantilever frame for a volume production machine. In every respect, the DT250 represents the pinnacle of "dual-purpose machine" development. It has everything that the serious off-road rider needs, including such refinements as unbreakable plastic front mudguards, re-settable trip meter and speedometer for the enduro enthusiasts, a chain tensioner and rubber boots on the front forks to keep out the water and dust. On top of all this, the 23bhp, five-speed power unit and lighting equipment that meets all Government regulations (it has turn signals too) mean that the DT250 is more-than-respectable performer on the street. The design of lightweight enduro machines has improved immeasurably over the past few years, with more and more manufacturers realising that not every trail rider wants to manhandle either the weight or the horsepower of the bigger machines on the tough trails. Yamaha has always offered a top-quality lightweight in its dual purpose Enduro range but there's no doubt that the new DT125MX is more than a match for any comparative machine. It follows the big bikes in the Yamaha DT range in having the monocross suspension chassis that Yamaha designed for its World Championship · winning moto-cross racers. Now that competition technology has been put to work on an Enduro lightweight with staggering results. Both in the chassis design and in its basic engine specification, the Yamaha DT125MX bears a close relationship to the Yamaha 125cc motocross racers that took Dutchman, Gerard Rond, to Grand Prix wins this year and which earned American National Championships for Bob Hannah and Broc Glover in the past two successive seasons. 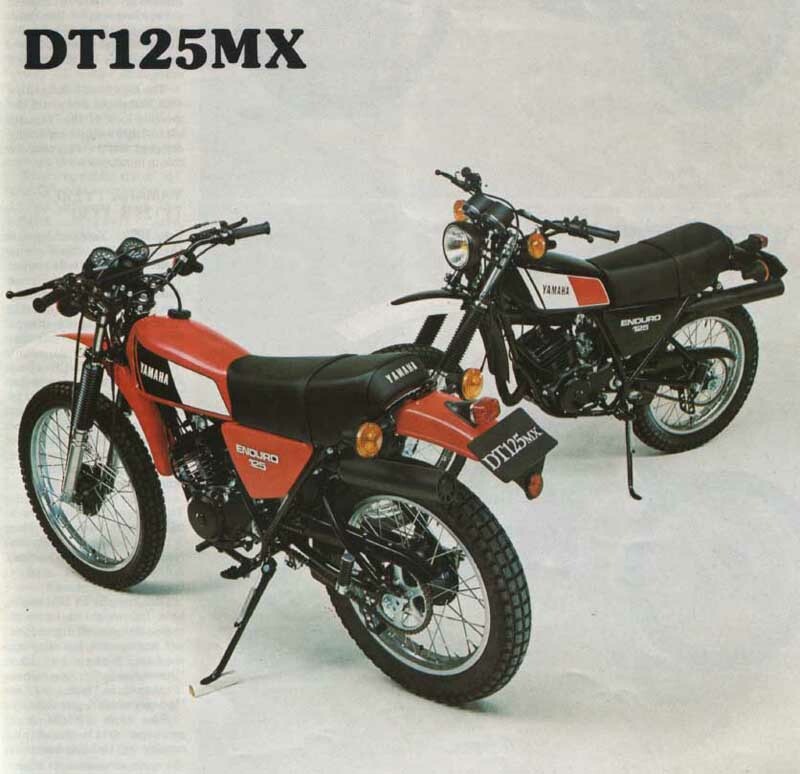 This race-breeding is evident in the performance and the handling of the DT125MX ... a machine that is unique in the Enduro field. It’s a tough trail lightweight that still has full street equipment making it capable of true double duty as a ride-to-work bike during the week and a really effective off-road lightweight whenever the getaway urge hits. The engine of the DT125MX is based so closely on the engine of the moto cross YZ125 that it even looks the same, with heat dispersant matt black finish, alloy deep-finned head and cylinder barrel. The motor features a racing piston plus competition transfer porting. A high-grade steel crankshaft runs in roller bearings and drives through a multi-plate clutch to the six-speed gearbox. It is all of this combined with reed valve torque induction that enables the engine of the DT125MX to produce true competition performance with street tractability. Just like the rest of the famous Yamaha DT Enduro range of dual purpose street/trail bikes, the new DT50 is equally at home on city streets or out in the rough country. Only difference between the DT50 and its bigger brothers. as far as capabilities go, is its lack of cubic inches ... and to those riders whose preference is towards lightweight machines, that won't matter a bit. The DT50 is a genuine endure machine on a small scale; a great little street bike that can carry you way across the city to work or out on the country lanes - but still a bike with true off-road capability. Sharing the same tough little four-speed, Torque Induction engine as the TY50 trials machine, the Enduro-styled DT50 features a large capacity 6 Litre tank (plus separate oil tank for the Autolube engine unit), braced handlebars and enduro mudguards. The high level exhaust pipe with heat shield completes the sporting look of this Yamaha ultra-lightweight especially designed with a dual-purpose role in mind.